The Northeast Quadrant blogger, Devin Toporek shoots Video of New York City’s Severe Thunderstorms and is on the phone live on The Weather Channel.CHECK OUT HIS VIDEOS HERE BY SCROLLING DOWN HIS BLOG AND CLICK ON THE VIDEOS! Today will be the most dangerous of the summer so far when combining dangerously high humidity (low to upper 70s) and dangerously hot air (upper 90s to mid-100s) from Atlanta to Albany! 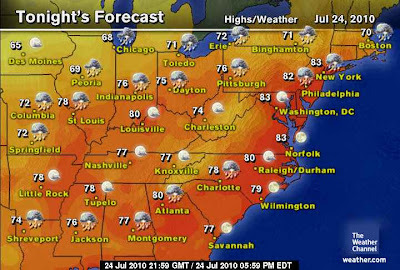 If you live in the region from Atlanta to Albany, expect dew points in the low to upper 70s and temperatures that will top at least 95 degrees. Combine the two and you can guarentee heat indexes of 100 degrees or more. 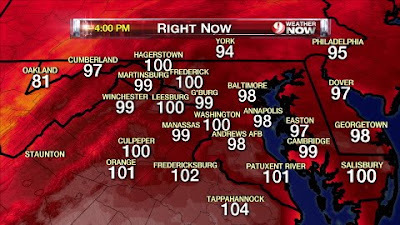 There’s a 596dc high pressure cell sitting right over central Virginia, this will support surface temperatures directly underneath the core of this powerful high to between 104-108 degrees… in a triangle from Richmond to Lynchburg to Washington DC, the temperature may climb to 105 degrees or HIGHER and dew points are at least 70 degrees. Areas such as Norfolk is already at 104 degrees and the Heat Index is currently at 117 degrees as of 2.05pm… Coastal areas from the Virginia Capes down along the Outer Banks will have dew points in the low, even upper 80s and combined with temps in the mid-90s, it’s likely we;ll see HI’s along the coast of between 120-125 degrees this afternoon! 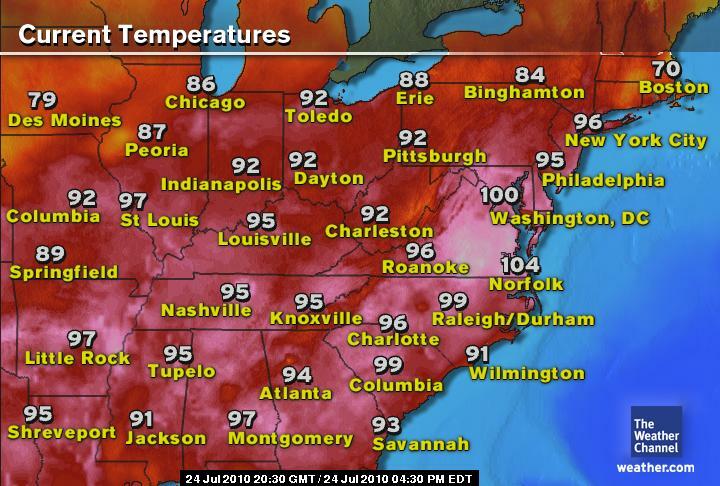 As for Philadelphia, PA it’s gonna hit between 98-102, Trenton, NJ 95-100, New York’s Central Park 95-98, Newark, NJ 96-102, Albany, NY 95-98, Boston, MA 90-95… Dew points and air temps combined will make the I-95 from DC to New York feel perhaps near 110 by the peak heating of the day! Lows tonight should be close to or above 80 from the heart of North Carolina to New York with spots such as the Carolina and Virginia coasts seeing lows perhaps as high as 85! Low to mid-80s for the bid cities. Whilst the Gulf Coast may see some thunderstorms blow with a southerly flow of moisture being drawn up from the Caribbean, inland it’s all about the heat with mid-90s for most places, some will approach or surpass 100 by 3pm. 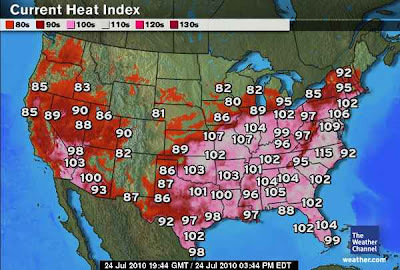 What’s the big concern is the high heat and very high humidity. Combine the two and everywhere will feel at least 100 degrees. 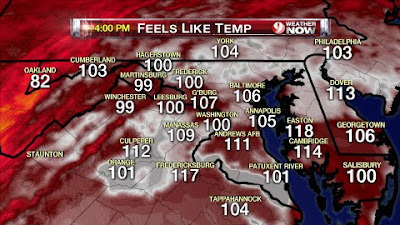 Some will feel closer to 110 or 115. The Carolinas coastal plain, just enough inland for 100s and close enough to the coast for for upper 70 to low 80-degree dew points will make for extremely dangerous heat index values which will likely run into the 120s. Tonight, it’s going to stay in the 90s until the early hours of tomorrow and perhaps may only fall to 85 degrees in some spots before rocketing beyond 100 again tomorrow! New Orleans should see storms and a high near 90 but feeling like 105, low around 82. 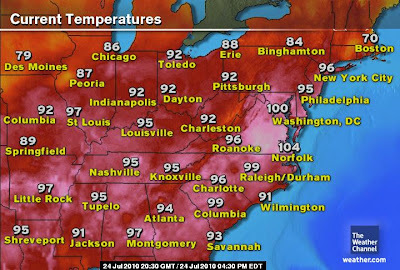 Montgomery will be 100, feeling like 105-110, low 80, Atlanta 95, feeling like 105, Low 78, Charlotte 97, feeling like 108-112, Low 80, Charleston 96, feeling like 118-122, Low 85. Florida will have a better chance of thunderstorms and temps down around 90-93 but there it’s going to be juicy with dew points between 74-82 and feeling closer to 110 for many spots throughout the state. Lows tonight across the state will fail to get below 78-83. Today will be a hot one for the Great Basin and Southwest with the core of the heat appearing to settle over Las Vegas where a high of 111 degree is expected (Low around 90). Phoenix will fall short with a high only around 104 degrees (Low around 87). Reno is likely to top 100 (Low around 70), Salt Lake City is likely to top around 95 (Low 65). Though it’s hot across the interior West, high are likely to only top around 65-72 at the beaches along the California coast and 75 within Downtown Los Angeles. Interior areas will reach the 90s at Riverside and 105-112 at Palm Springs.. Death Valley is likely to peak into the low 120s, perhaps nearing 124 by late afternoon. A warm to even hot day for the PNW with Seattle to Portland enjoying 85 and 90 respectively, whilst interior areas will endured mid 90s to mid-100s!! Everywhere will enjoy abundant sun. Lows range from the upper 50s to around 60 at the coast and coastal plain whilst the mtns drop into the 40s and 50s, east of there the low will be in the 60s to near 70. For Montana the high will range from low to upper 80s with lows in anywhere from the 30s and 40s at high elevation to mid-60s in low elevation and urban areas. 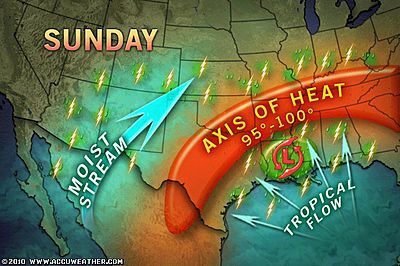 Another relatively hot day, particularly for eastern areas of the southern plains from Houston to OK City where highs will reach the 90-94 degree range though isolated thunderstorms are likely to flare into the afternoon, whilst upper 80s to around 90 will be the high over western Texas and Oklahoma. Lows will range from low 70s in the west to upper 70s in the east, around 80 at the coast. Today will see storms flare in the eastern side of the N. Plains including the Lower Midwest to northern Minnesota, whilst clearer, sunnier and more settled weather sets up over the central and western Dakotas. Highs will be relatively low today with only a range of 4-8 degrees across the board. 80-83 in the Dakotas to a slightly lower 78-80 in Minnesota, Wisconsin, Iowa, Illinois. Chicago will only make it to around 84 with storms whilst a dissapointing 80 tops the core in MSP. Whilst the Northern half of the region is stormy and fairly cool, the Kansas City to St Louis corridor remains hot, humid and stormy with highs running into the mid-90s and real feels this afternoon will reach the 100-110 range. Lows tonight will once again struggle to get below 80. 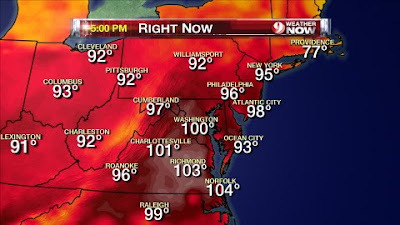 AFTER A 108 DEGREE AFTERNOON IN VIRGINIA, A HOT NIGHT LIES AHEAD! Mumbai city and the konkan coast was lashed by heavy rains on Saturday. Now, the system should move west, and will be over East M.P/Vidharbha/Chattisgarh by Sunday. As the peak intensity is done with, the rains along the coast may sober down to some extent on Sunday. In the 9 hrs, from 08.30 am till 5.30 pm, Saturday, Mumbai Colaba measured 135 mms and S,Cruz 97 mms of rain. On sunday night, city should get another spell of heavy rains, and the night rains should measure about 35-40 mms, adding upto aroound 170 mms in 24 hrs ending Sunday morning. Sunday rains will be heavy at times, but not as consistent as Saturday,and more spaced out. With somewhat frequent showers, Sunday should guage up about 60-75 mms. As the system moves towards west M.P, a slight increase in rains on Monday would be expected, to about 75 mms. Tuesday, I would see some decreasing of the Mumbai rains. By Tuesday, system would have crossed Gujarat, with a tendency to move back into the Arabian Sea.It would not be out of place to expect some rains on Tuesday, (when the system will re-emerge),along the Karachi coast. COLA estimates the new low in the Arabian Sea to move into Oman. The Northern belt, already reeling under floods, will get a respite from rains next week. Central India will get the brunt of heavy rains this weekend.And Gujarat form Sunday thru Tuesday should get good rains. Its on now! Another low could be expected to form in the bay around the 27th/28th. a off shoot pulse from the latest typhoon in the Pacific.